Christmas is anticipated all year round for the joy of giving, the fun of receiving, and the message of hope the holiday gives. Honoring the birth of Jesus, Christmas is a religious observation celebrated with hymns, special services, prayers, and remembrance of others. Incorporating long-held traditions from around the world, the holiday also welcomes Santa Claus, also known as Father Christmas, Saint Nicholas, Papá Noel, Ded Moroz (“Grandfather Frost” in Russian), Julenissen (“Christmas Gnome” in Norway), and many other names, who brings gifts to children on Christmas Eve. The day inspires family dinners, home baking, parties with friends, and togetherness. “Jesus was beautiful, like all babies,” but on the night he was born he cried and cried. Mary tried everything to comfort him—a warm blanket, feeding him, rocking him—but nothing soothed him. Looking on, the other animals longed to help. “Doves fluttered down from the rafters, settling on the creaky stable door.” Although their coos were soft and musical, the baby did not stop crying. The gentle brown cow tried next, lowing the lullaby she used on her own calf, but Jesus cried louder. And even though the donkey meant well, her braying “made Jesus cry loudest of all.” Then from a hiding place a little kitten crept “step by careful step” toward Mary and Jesus. Leaping lightly onto Mary’s lap, the kitten “nuzzled Jesus’s neck. Then he began to purr, a calm, contented purr that came from deep inside.” Jesus gazed at the tiny kitten, and as he touched the soft fur his crying quieted. The barn grew silent and the new family and all the animals slept soundly. Image copyright Amy June Bates, courtesy of Dial Books for Young Readers. It was much too dangerous to linger, and so, sadly, the family left Bethlehem without their beloved pet. In the chill night air, Jesus was uncomfortable; he missed his cat. “He clenched his tiny fists and screamed.” Joseph worried. Were the campfires on the horizon Herod’s soldiers? Could they hear Jesus crying? Both Mary and Joseph missed the calming influence of their cat. Suddenly, Jesus heard a familiar wail. Out of the basket tied to the donkey’s flank popped his companion. Jesus reached out for him, and the cat leaped into his arms. In her Author’s Note following the text, Maryann Macdonald reveals that her story is inspired by Leonardo da Vinci’s drawings of La Madonna del Gatto or the Madonna of the Cat, in which the baby Jesus is depicted holding and playing with a cat as he sits on his mother’s lap, as well as legends of a cat that lived in the stable where Jesus was born. Maryann Macdonald’s gentle story of the baby Jesus soothed by a kitten on the night he was born and saved by this same pet on his flight to Egypt will captivate young children. The focus on the child-animal bond will delight little ones with pets of their own and makes the Christmas story immediately accessible. Macdonald’s lyrical language beautifully portrays the emotion and setting of the story, and she establishes the danger faced by the family with age-appropriate suspense. Amy June Bates enhances the story with gorgeous traditional paintings of Mary, Joseph, and Jesus, the stable and its animals, and the nighttime journey to Egypt. Her watercolor, gauche, and pencil illustrations glow with warm ambers, greens, and midnight blues. The barn animals are sweetly gentle and earnest in their attempts to soothe the crying baby, and the realistic portraits of the family demonstrate their love for each other. Children will especially like the images of Jesus and his pet cat cuddling and playing together. The final illustration of Mary, Jesus, and their cat echoes the drawing by Leonardo da Vinci that accompanies the Author’s Note. For pet owners and animal lovers, The Christmas Cat would make a meaningful addition to their holiday collection. To learn more about Maryann Macdonald and her books, visit her website! To view a portfolio of artwork by Amy June Bates, visit her blog! This cute kitty is all decked out for the holiday! 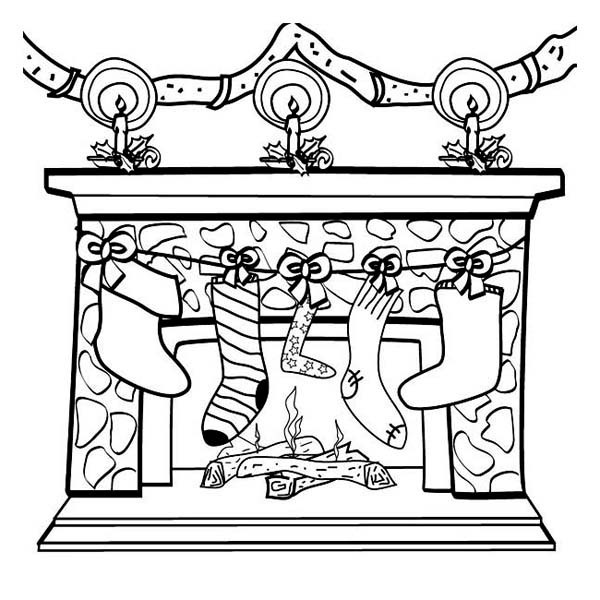 Have fun with this printable Cute Christmas Cat Coloring Page! Christmas Day is getting close! Are you ready—tree decorated, all gifts bought and wrapped, cookies baked? Or are you feeling a little stressed? Today’s holiday was created to give you a chance to let off a little steam and say “Bah, humbug” if you feel like it. So, it’s okay to let out your inner Scrooge today before you get back into the holiday spirit! Disney-Hyperion sent me a copy of Santa Bruce to check out. All opinions are my own. So the geese decorated, and the mice made eggnog. And Bruce? He was not happy. He was awake and he was cold. And because he was awake and cold, he was shoveling the walk in his red long underwear. And that’s when a raccoon made an erroneous conclusion, and Bruce was the victim of “a case of mistaken identity.” Again. Copyright Ryan T. Higgins, 2018, courtesy of Disney-Hyperion. What was Bruce’s reaction? He headed for bed. When the mice protested, Bruce reminded them that he didn’t have a sleigh. The mice easily fixed that with a wagon and a sled. How about reindeer?, Bruce countered. Well, what else are geese for? Okay, Bruce conceded, but what about the presents? The mice had that covered too. And so it was that on that magical night that Santa Bruce made the rounds to all the good little forest critters (and even to the “grown up Bunny who still lives with his parents”). As morning dawned and Santa Bruce trudged back home, happy tykes were waking up to a beautifully wrapped present. What was it? You’ll have to join the holiday feast and see! A new Bruce book is always a cause for celebration, so combining a celebration with a new Bruce book makes the holiday doubly exciting. Ryan T. Higgins’ woebegone Bruce is just trying to make his kids (and those mice) happy when another case of mistaken identity turns his winter topsy-turvey. Bruce’s tetchy responses as he loses control of his fate and becomes Santa Bruce as well as the silly asides and persuasive pleas from the mice will have kids in stitches. Sly references to holiday songs, Christmas clichés, and even a spring holiday add to the zany hubbub, and the little ones’ Christmas wishes will make adult readers chuckle. Higgins’ unibrowed bear wears his signature scowl with aplomb—not even cracking the wee-est smile as a houseful of tiny, adorable hopefuls cheer and shout for “SANTA!” As usual, the mice are jubilantly unconcerned with Bruce’s feelings, giving him, in turn, thumbs up and innocent eyes as they cajole Bruce into creating their vision of the perfect holiday. The guileless geese are just happy to be along for the ride, and the forest children are sweetly excited to get their special present. Destined to become a holiday classic, Santa Bruce has laughter, generosity, and togetherness all wrapped into one—and isn’t that what the holidays are all about? A must buy for home holiday and anytime reading. Discover more about Ryan T. Higgins, his books, and his art on his website. With this craft you can make a little book for your own writing, pictures, or stickers. With a holiday-themed cover, you can use it as an advent calendar or holiday wish list. This little book would also make a fun gift to make for your friends. Draw a line from the top of the paper to meet the left edge of the 6-inch square. The line will be 3 inches from the left side of the paper. Beginning with the line at the top of the piece of paper, cut down the left edge of the 6-inch square. Cut across the bottom of the square. Cut across the top of the square to the line in the center. Starting at the top of the strip, fold the paper on the lines accordion style. Make the first fold by folding the first 3-inch section down towards you. Fill the book with writing, drawings, stickers, whatever! Today’s holiday gives people an opportunity to learn about and appreciate the variety of evergreen trees that grow locally and around the world. During the winter these giants stand out against snowy landscapes with their deep-green needles that retain their color all year around and always offer the hope of spring. For those who celebrate Christmas, the evergreen is a highlight of the celebration. Decorated with lights and sparkly ornaments, the tree is where family and friends gather to exchange gifts and share time together. Look for an Evergreen Day was created by the National Arborist Association to encourage people to enjoy the beauty of these special trees. Image copyright Jarvis, 2017, text copyright Patricia Toht, 2017. Courtesy of Candlewick Press. But they don’t start decorating yet. They call their friends to come and help. With the house full of cheer, the kids string the lights, wrapping them around the branches. Next come the ornaments—“Jolly Santas, / Dancing elves. / Wooden reindeer. / Jingle bells. / Lacy snowflakes. / Paper dolls. / Candy canes and / bright glass balls.” With hooks and string the bright ornaments are hung on the tree. Patricia Toht’s lively rhymes engage kids in one of the holiday season’s most fun activities—picking out and decorating the Christmas tree. Her step-by-step verses brim with the growing excitement of the day and encourage sharing the celebration with family and friends. As they read, kids will be caught up in the fun and memories of this favorite tradition. Vivid, action-packed mixed-media illustrations in a rich color palette by Jarvis take readers to the Christmas tree lot with its rows and rows of different trees to choose from and back to the family’s cozy home—where a dog and cat are happy to help out. As friends and neighbors drop by for the decorating party, kids will love recounting their own experiences hanging the lights and pointing out ornaments that may look like their own. The fully decorated tree glows in a two-page vertical spread that will wow little readers. A sweet family story full of smiles, eager anticipation, and a love of Christmas, Pick a Pine Tree is a magical read to add to holiday story times. Discover more about Patricia Toht and her books on her website. To learn more about Jarvis, his books, and his art, visit his website. Can you help the kids sled their way to find the evergreen tree in this printable maze?